ShopVOX is a web-based manufacturing solution designed for custom manufacturing businesses. The industries that are using this management solution include commercial signs, screen printing, awards and engraving, embroidery, apparel, and promotional products. 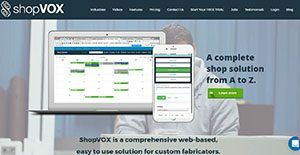 Described as a very comprehensive software, ShopVOX is built to increase the productivity and profitability of custom fabricators. The functionalities present in ShopVOX are job management and scheduling, production management, sales tracking, employee management, art approval system, work order management, point of sale and material requests, and customer management. ShopVOX also offers users the capability to accept online payments via Authorize.net. The software can be easily implemented through the aid of its setup wizard, enabling shops and companies to configure its basic settings to match their needs and specifications. ShopVOX offers job and production management functionalities. Users will be able to create job tickets and view the specifications of jobs. Job tickets are created on the Work Order section. They can input details of a job, such as its design, production, shipping, and installation. Customers can also easily approve design layouts or any job files online. ShopVOX has an online proofing system, which allows users to send layouts and files directly to their customers. Notifications are sent to staff when a layout is approved or when the customer made changes in it. As part of its production management capabilities, ShopVOX allows the annotation of on site survey photos. Users will be able to add notes to photos, indicating store measurements, installation guides, and design ideas. These capabilities help custom fabricators organize their jobs well, including all the job files they need. Another powerful functionality offered by ShopVOX is its vendor management capability. With this functionality, users can easily request materials needed for a work order. They can also rank their vendors, based on which ones they prefer when ordering materials. To easily check costs of materials, the prices of materials can be associated to the vendor’s pricing. Furthermore, ShopVOX has a task management functionality. Users can assign tasks to their employees, depending on their roles and responsibilities. Its User Dashboard is built to show the specific responsibilities of each employees. If the employee is a salesperson, the User Dashboard will show all the sales, leads, quotes, orders, and invoices of that person; but if he or she is a designer, it will show all of the designs produced by that employee. If you are interested in ShopVOX it might also be beneficial to check out other subcategories of Best Business Process Management Software collected in our base of SaaS software reviews. Every business has its own characteristics, and may call for a particular type of Business Process Management Software solution that will be adjusted to their company size, type of clients and employees and even individual industry they cater to. It's not wise to count on locating a perfect app that is going to be suitable for every business regardless of their history is. It may be a good idea to read a few ShopVOX reviews first and even then you should keep in mind what the software is intended to do for your company and your employees. Do you require a simple and straightforward app with only essential functions? Will you really make use of the advanced functionalities needed by experts and big enterprises? Are there any specific tools that are especially practical for the industry you operate in? If you ask yourself these questions it is going to be much easier to locate a trustworthy service that will fit your budget. How Much Does ShopVOX Cost? We realize that when you make a decision to buy Business Process Management Software it’s important not only to see how experts evaluate it in their reviews, but also to find out if the real people and companies that buy it are actually satisfied with the product. That’s why we’ve created our behavior-based Customer Satisfaction Algorithm™ that gathers customer reviews, comments and ShopVOX reviews across a wide range of social media sites. The data is then presented in an easy to digest form showing how many people had positive and negative experience with ShopVOX. With that information at hand you should be equipped to make an informed buying decision that you won’t regret. What are ShopVOX pricing details? What integrations are available for ShopVOX? If you need more information about ShopVOX or you simply have a question let us know what you need and we’ll forward your request directly to the vendor.